There was once a time that tourists to Cartagena were warned to stay clear of Getsemani, the colourful neighborhood being considered a little too “caliente” in the wrong sort of way. Thankfully times have changed, the area is now super safe and offers visitors a chance to experience more of the culture of Cartagena, beyond the film-set like touristy perfection of the historic walled center. This is a neighbourhood where locals live; they eat belly-filling “corrientes” at affordable prices from hole-in-the-wall restaurants, dance to champeta and vallenato blaring out from giant sound-systems in front of their homes, buy their groceries from the corner store (normally pausing to check the football score at the same time), play after school sports in the plaza, and generally fill the streets with a vibrancy and warmth you won’t encounter anywhere else in the city. 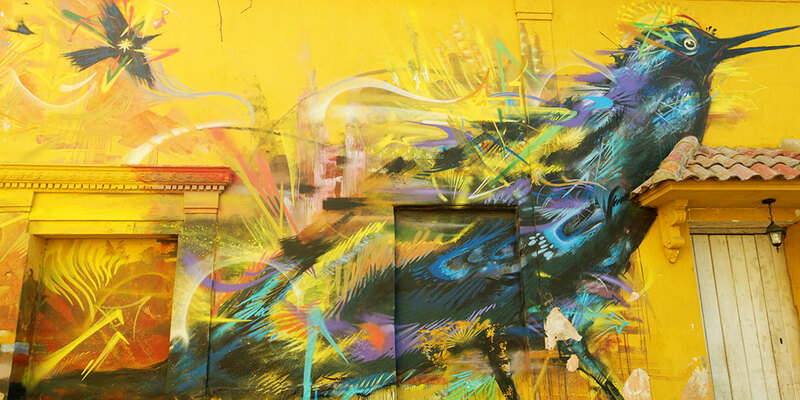 This tour focuses on the history, politics and culture of Getsemani and the greater Cartagena/Colombia whilst exploring the incredible murals and streetart of the neighbourhood. You'll learn about the artists and the messages behind the art..
Meeting place is in front of the Restaurant Nautilus, with a view of the Giant Building Mural dedicated to Afro-Colombian women. Meet time can be 10am or 3pm.